The Joanna Briggs Institute (JBI) is recognized as a global leader in evidence-based healthcare. JBI was established at the University of Adelaide, South Australia in 1996 as an international not-for-profit research organization. JBI collaborating centres around the world promote and support the synthesis, transfer and utilization of evidence through identifying feasible, appropriate, meaningful and effective healthcare practices to improve healthcare outcomes globally. The JBI is endorsed by the well-established international Cochrane Collaboration. The Cochrane Nursing Care Field is coordinated from the School of Translational Science at the University of Adelaide. The School of Nursing is pleased to share the work of the Joanna Briggs Initiative Team. 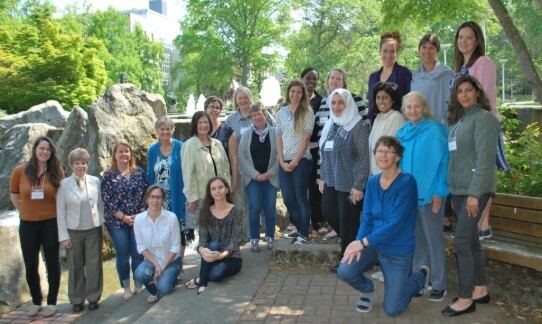 Since July 2012, seven School of Nursing faculty members, four doctoral students, a UVic librarian and one faculty from Camosun College have undertaken JBI Systematic Review Training. We are also engaged with partners from Island Health, Loyalist College (ON), BC and Yukon, Heart and Stroke Foundation. Effectiveness of physical activity interventions with healthy older women: a systematic review. Student and educator experiences of maternal child simulation-based learning: a systematic review of qualitative evidence. The experiences of pre-licensure or pre-registration health professional students and their educators for working with intra-professional teams: a systematic review of qualitative evidence. Young, Lynne; Sheets, Debra; Paul, Kathryn. Effectiveness of physical activity interventions with healthy older women: a systematic review protocol. The JBI Database of Systematic Reviews and Implementation Reports. November 2013; 11(11): 77-87. MacKinnon, Karen; Marcellus, Lenora; Rivers, Julie; Ryan Maureen; Gordon, Carol; Butcher, Diane. Student and educator experiences of maternal child simulation-based learning: a systematic review of qualitative evidence: a systematic review protocol. The JBI Database of Systematic Reviews and Implementation Reports. January 2015,: 13(1): 14-26. Butcher, Diane; MacKinnon, Karen; Bruce, Anne; Gordon, Carol; Koning, Clare. The experiences of pre-licensure or pre-registration health professional students and their educators in working with intra-professional teams: a systematic review of qualitative evidence protocol. JBI Database of Systematic Reviews and implementation Reports. July 2013: 13 (7): 119-130. Skar, Pal; Young, Lynne; Gordon, Clare C. (2015). Changes in blood pressure among users of lay health worker or volunteer operated community-based blood pressure programs over time: a systematic review protocol. JBI Library of Systematic Reviews and Implementation Reports. October 2015; 13 (10): 30-40. The effectiveness of ‘offsite’ simulation learning events compared to ‘onsite’ simulation learning events on the performance of health professionals: a review of quantitative evidence. The phenomenon of pre briefing in simulation based learning for health professionals: a systematic review of qualitative evidence. Nurses’ experiences of organizational change: a systematic review protocol.